Body By Kariim Fitness » What’s In Our Lunch Box? I hope that everyone enjoyed their Labor Day holiday! “What’s In Our Lunch Box?”. The food you see, is what we are taking to the gym/work with us tomorrow. I’ll start by giving you a brief timeline of our day. Wake up time 4:00 am. Arrive to the gym for our first client at 5:00 am. Train clients from 5:00 am until 11:00 am. Kariim & I workout between 11:30 am – 1:30 pm …..head home, walk Nash, eat Lunch, run errands if need be, Quick nap…then back to the gym by 4:15pm – 8:00pm for evening clients. 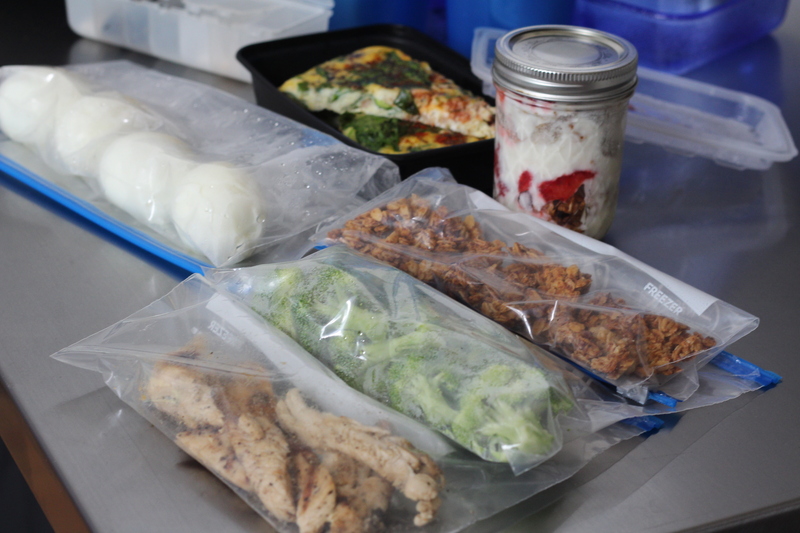 Meal Prep is a must when you have a demanding schedule & it helps keep you on track with your health & fitness goals. 2 Gallons of water, 2 protein shakes & Daily Vitamins. Pictured: 4 Boiled eggs, 3 servings of Fritatta, Sliced Chicken Breast, Raw Broccoli, Greek Yogurt Parfait w/ strawberries, and an extra ziplock of Fresh Granola. NOTE: This is enough food for both of us the have breakfast, snacks, & a pre-workout snack. Whatever we don’t finish will be used as evening snacks. 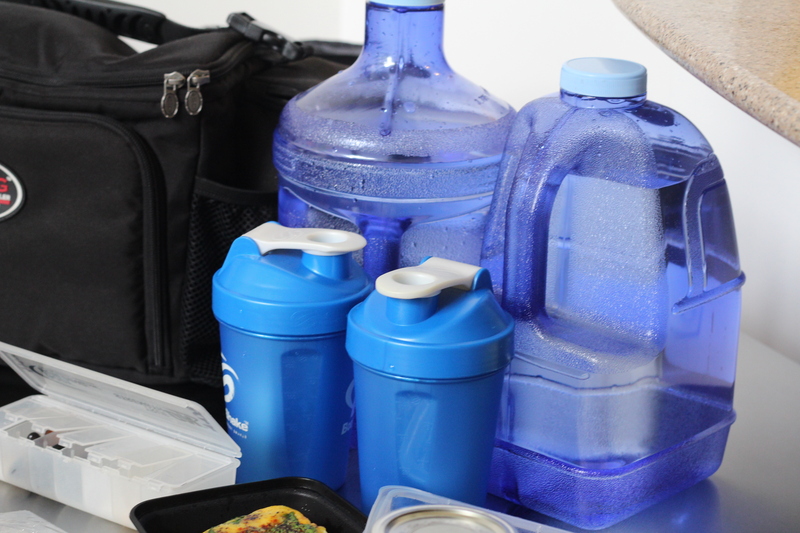 Wake up have 8 oz of water then Protein Shake— get dressed. Arrive at BBK – train first client. During that client, begin drinking green tea. We begin eating our solid meal by 7:00 am. Finish green tea. Take daily vitamins with first meal. After that meal, the snacking starts every 2 hours. With having such high metabolisms, some days we might eat a small snack every hour. Lunch— IS NOT IN THE LUNCH BOX. We have Lunch prepped at home. Dinner is made fresh every night. Great!!! 🙂 Thank you sooooo much for your support! This is really helpful! Love it! This is very helpful. What do you eat before and after your workouts? 1. Greek yogurt with the berries & granola. Immediately after our workout we have a Protein Shake & Fruit while driving home.